Yes, I know, you all expected a blog with my observations of this weekends General Conference....I will get there, but it will probably be a few days. I was always a baseball fan, don't know exactly how or why that came to be, but when I was a kid, I liked the Los Angeles Dodgers. In 1982, we went to Anaheim for a family vacation, I'm sure you can see where this story is headed, but it is my blog, so I will tell the story how it goes anyway...We went to my Uncle Arvids house, who happens to live near Disneyland, and he had the Dodgers game on TV. The family all went out back to the patio to visit and such. I leaned on his little stairs next to the TV and was watching the game. My uncle came in for something and invited me to go out with them and even offered to change the channel on the TV, after all, I was just 11 years old (on to the 12th inning tonight, whew!) and a girl at that! My mom says Uncle Arvid went out to the patio with his jaw dropped and when asked why he said, "A GIRL that likes baseball?!!!" (yay, the ANGELS score, now to keep the Red Sox scoreless in the bottom half!!!) Needless to say, the next evening they all surprised me and took me to my first Major League Baseball game at Anaheim Stadium! 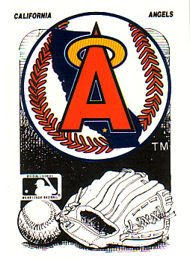 I was hooked and have been a CALIFORNIA ANGELS fan ever since! Ok, so back to reality, we are 2 outs away from winning this game 3 and continuing the season....1 out away.....AND NOW THEY HAVE DONE IT!!!! WHEW!!! YAY ANGELS!!! Those that know me, know that I often cheer for the underdog, so my joy only lasted one day, there is always next season!